With the help of loving and intact families and their church, many Lithuanian-Americans here were able to rise above generations of harsh oppression in the old country and harsh conditions in the new to achieve a kind of impoverished respectability. Not, all, however. I would wager that almost every Lithuanian-American from Springfield has at least one outlaw or outlier in the closet, not too many generations back. Some of these “outlaws” were probably genetically disposed to go a-wilding. The majority, I would guess, had never known a family or community life un-marred by unnatural death and spontaneous acts of violence: crimes of passion, temporary insanity or inebriation that served to relieve unbearable pressures from the daily struggles of living–unfortunately, by doing harm to a fellow human being who was similarly struggling. Of course, there was little treatment for the disease of alcoholism, let alone the full spectrum of mental illness or criminal tendencies at the turn of the Twentieth Century—no welfare or social safety net. Insecurity–physical, economic and social–was the rule for most immigrants, and early death smote the upstanding as unexpectedly and frequently as the morally or criminally deranged. Property crime to support the family after the injury or death of a father in the coal mines launched more than one disadvantaged youth into the Illinois penal system. According to Wally Surgis, Jr., bootlegging during Prohibition provided the perfect pathway to illegal activity for Lithuanians and other immigrants for whom alcohol consumption and production was a way of life. In fact, pervasive alcoholism and crimes under-the-influence in burgeoning immigrant communities drove much popular support for the Christian Temperance movement that resulted in Prohibition. Wally, Jr. reports that his Surgis (Sudrius) grandparents in Auburn were illiterate but owned a still. During Prohibition, Wally’s father, Walter, Sr., and his sister were employed by their parents to haul illegal, home-made alcohol to customers. Grandfather Frank Surgis, Sr. actually became quite rich from his bootleg trade, and later went to live with his daughter on E. Mason in Springfield, where medical treatment for black lung disease eventually ate up all his earnings, so that he died in the same poverty he thought he had escaped. Young Wally, Sr. continued on the wrong side of the law, eventually running with the famous Southern Illinois bootlegging gang headed by immigrant Charlie Birger, and serving sentences at Menard (Chester) for bank robbery and bootlegging. Wally, Jr. adds: “During Prohibition or the Depression, my father and a friend from Auburn got hold of some phony deputy sheriffs badges and went into the bars in Springfield under the guise of being officers of the law. They confiscated the slot machines, took them somewhere and broke them open for the money inside. It didn’t take long for the big boys in Chicago to come downstate to put a permanent stop to this. Wally, Sr.’s criminal career did not later prevent him from working for Pillsbury Mills and the City of Springfield. He was also famous for fishing and gardening and sharing produce with the poor of E. Reynolds St. through friend and barkeep Tony Romanowski (Ramanauskas). 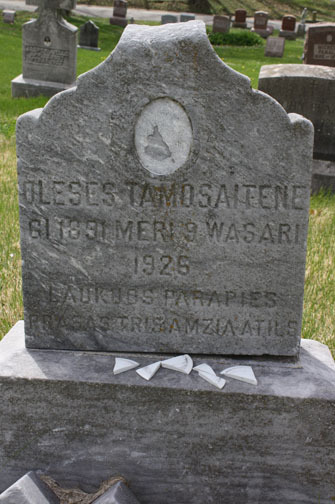 To see just how pervasive crime and unnatural death were in the Lithuanian immigrant community here, one only need look at the Sangamon County Coroner’s inquest book from a 12-day period in February 1926. According to these records, on Feb. 9, Alice Tamoszaitis, 37, born in Lithuania, was shot and killed at 6:30 a.m. in her home at 1604 E. Carpenter by Charles Kaziusis, while the defendant was apparently “laboring under some delusion with murderous intent.” Kaziusis subsequently shot himself through his left lung and died on Feb. 22, according to newspaper reports. John Blazis, 45, of 2565 S. College, was cut in half by a train on the Wabash tracks between the Wits and Iles junctions at 6:15 a.m. Feb. 18. No speculation was offered as to whether the death was intentional, but it appeared Mr. Blazis had fallen or was lying across the tracks. Then on Feb. 21, my father’s uncle by marriage, Frank Orback, Sr., died after consuming a quantity of 55-proof alcohol with traces of poison wood alcohol that had been sold to him (despite Prohibition) by Antanas and Ursula Lawrence (Launikonis), as alleged by Frank’s widow Anna Orback in a civil suit for $10,000 in damages, which she later dropped. I almost always stumble over arrests/crimes involving local Lithuanian immigrants when searching newspaper archives for other information. For example, in 1910, Lithuanian immigrant William Gurski was charged with stabbing his countryman and N. 15th St. neighbor Tony Krodok in the right lung as he stepped off a streetcar following a dispute between the two men earlier that night in a downtown bar. Krodok was described as a boarder. Both men were probably miners. Lithuanian Mike Karinanski also was later held for complicity in the stabbing. 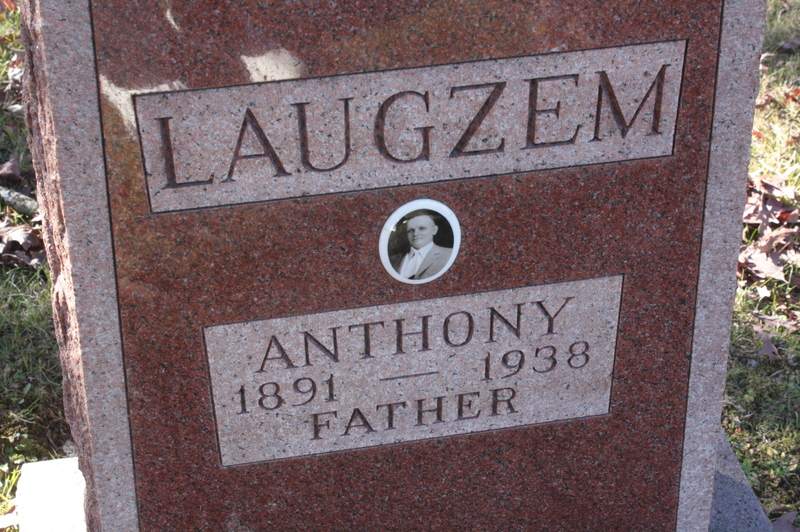 The case of Anthony (Antanas) Laugzem (1891-1938) is an example of the alcohol-fueled violence that could erupt at immigrant social gatherings. Despite his pleas of innocence, Laugzem was found guilty of murdering a fellow Lithuanian-American, Tony Pachules, by a Sangamon circuit court jury on Oct. 18, 1922, according to the Illinois State Journal. Party guests had placed bets on an informal dancing contest at the Laugzem home on E. Black St., in the Ridgely neighborhood. Laugzem testified that a dispute erupted between the victim and another man over their bets, and he asked both men to leave. Pachules, the victim, was shot in the back while walking away from the house. His deathbed statement claimed he turned and saw Laugzem firing from the porch, but Laugzem never wavered in his testimony that he remained inside the house and that the other man who was asked to leave must have shot Pachules. Photo by William Cellini, Jr. It seems clear that the same language and economic barriers that ghettoized immigrants also made violent crime largely an “all in the family” affair. Many individuals could survive and succeed only by cutting themselves loose from the lifelong burden of relatives who consistently drank away all their earnings, then begged for money, or descended into a life of crime. Clearly Lithuanian-on-Lithuanian violence, including domestic and sexual abuse, added significantly to the minefield of risks Lithuanian immigrants and their offspring had to sidestep while walking the “straight and narrow” in their adopted land. Fascinating-would be the makings of a great novel! Interesting bit of social history. Bet this one took more research to put together than many. Thanks for a fascinating read!